Strutting premium thin chassis, the iPhone 6 and Z3 are some of the best-looking devices on the market, and Sony's phone is waterproof at that. 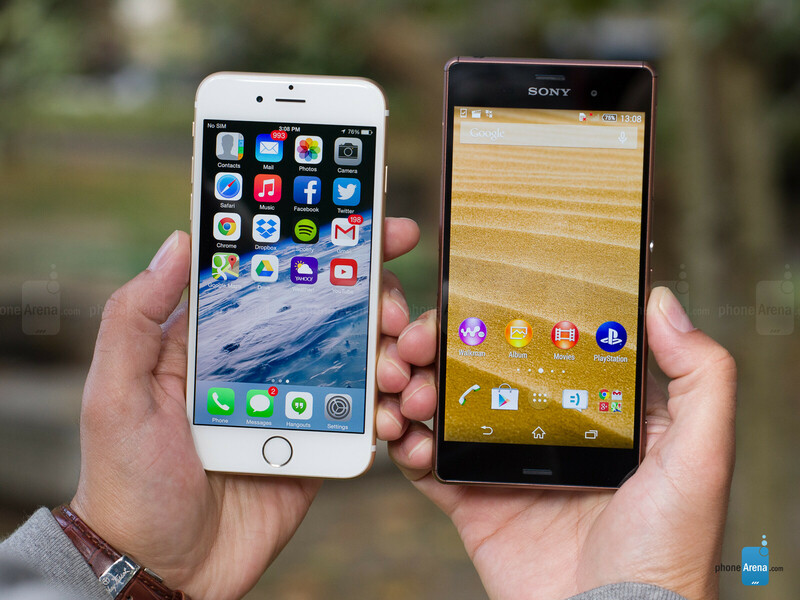 The Xperia Z3 is not a small phone for its 5.2” screen diagonal, especially when you compare it with some screen-to-phone size champs at the same display size. This is due to the fairly wide top and bottom bezels, which holds true for the iPhone 6 as well, but since it has a smaller screen, the iPhone 6 is still much easier to use with one hand, against the Z3. Those comparatively wide bezels on both handsets are there for a reason, though – in the case of the Z3 they house waterproof stereo speakers, while the iPhone 6 flaunts a state-of-the-art fingerprint sensor in the circular home key underneath the display. The two phones are both rather razor-thin and pretty light, though, which helps acknowledging them as elegant, despite the unimpressive screen-to-phone ratios. The iPhone has a finely crafted, premium metal design, but Sony's creation, with its rounded corners and glass chassis, is a looker, too, plus it sports a high IP68 waterproof rating. Looking around the sides, we find the signature OmniBalance design circular power/lock key at the right of the Z3, which is a bit wobbly, and requires you to bend your thumb to feel and press, while the lock key on the iPhone 6 is placed comfortably right under the tip of your thumb. The Z3 has a lot more going on at the right side, as you can find the somewhat too thin volume rocker there, the microSIM and microSD slots, and the dedicated two-stage camera shutter key. 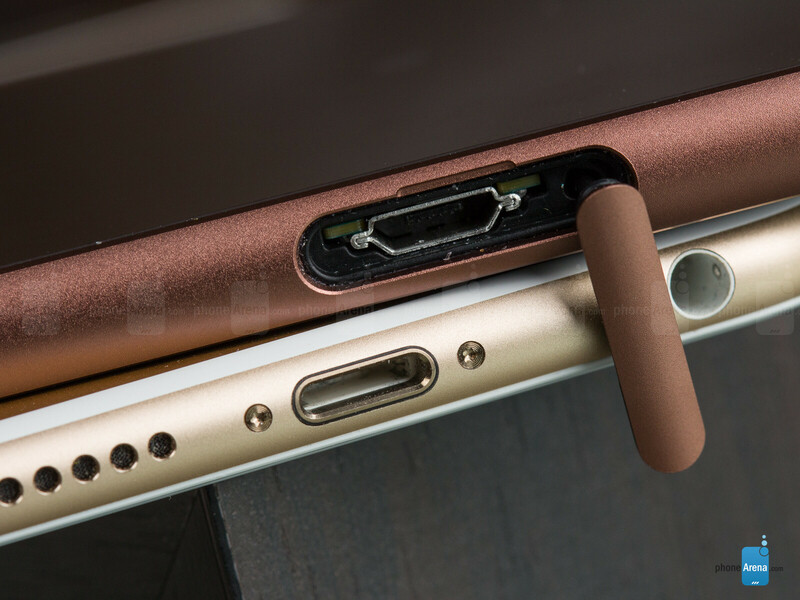 Both the card slots, and the microUSB port on the left are covered with protective flaps, ensuring the waterproof chassis, and if you are too tired to pry them off for charging the phone, there is a magnetic connector on the left of Sony's phone for USB charging with a separate cable. Looking at the premium glass or aluminum backs, what we don't like on both handsets is the camera placement in the upper left corner, as it is too near the edge, and very easy to cover with your finger when filming. Marred by decrepit color presentation compared to the iPhone 6, the Z3 screen makes it up with size and resolution. The iPhone 6 has a 4.7” panel with 750 x 1334 pixels resolution, which returns a lower, 326ppi pixel density, compared to the Z3's 5.2 inch panel at 1080 x 1920 pixels and excellent 424ppi. Still, the pixel density on both displays is more than enough for any need, and small text, as well as tiny details look sharp and discernible. 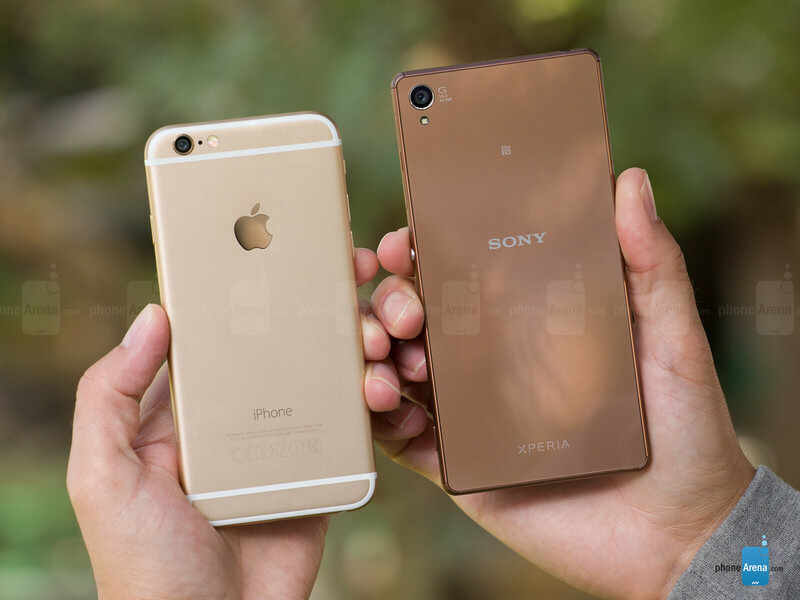 Here the iPhone beats it – its colors are very accurate, while the Xperia Z3 not only has most of the colors out of whack, but its screen is very cold, too. Sony clarified that it actually did this on purpose, as the trend for TV screens is now colder whites, which are recognized as brighter by the brain, compared to the natural-looking ones. Be that as it may, we'd prefer to go shoe-shopping on the iPhone, rather than the Z3. Granted, you can adjust the white balance of the Z3 panel from the display settings, done by boosting the intensity of the three basic colors, which looks a bit artificial. On the other hand, Sony's Z3 display tech allowed it to achieve more than 700 nits of brightness in our measurements, which also results in better outdoor visibility than the iPhone 6. In addition, the new LED backlighting is even more power-efficient than before. Combined with the “memory on display” tech, which doesn't use graphics processing power for refresh when displaying static images, the Z3 screen allows for some record battery life in the category, color-credible or not, but more on that later. As for viewing angles, since we have quality LCD panels, both handsets are showcasing well here, with a slight advantage for the iPhone 6. Sony's 5.2” display can also be operated with gloves on in a super-sensitive mode, which could come in handy during the winter months. Oh Xperia Z3, you're so beautiful. Considering they are comparing the iPhone 6 and not the 6 plus to the Z3. The Z3 kicks the iPhone 6 to the curb. The Z3 has a 1920x1080 display vs the iPhone 6 1366x750 display. The Z3 has stereo speakers vs the iPhone 6 mono speaker. 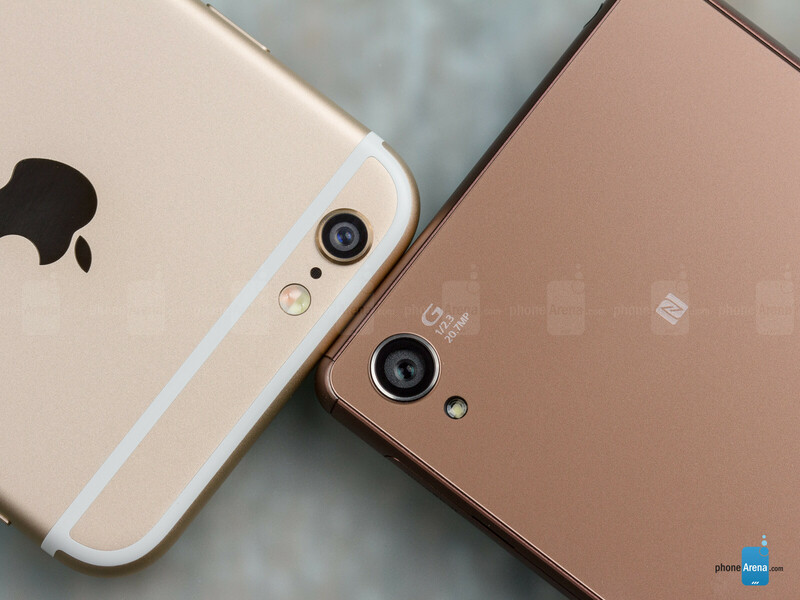 The Z3 is ip68 (dust and water resistant) vs iPhone 6 with NO dust or water resistance. The Z3 has 3gb of ram vs iPhone 6 with 1gb of ram. But it runs Android so...fail..
That is highly subjective. When device runs ios that is fail in my books. I know you like Apple because your using into your profile picture. Anyway, don't cover yourself because most Lebanese smell nasty and strong union when they get wet especially for man. So you better bring perfume to spray on your body so that you won't smell nasty smell in your underarms. 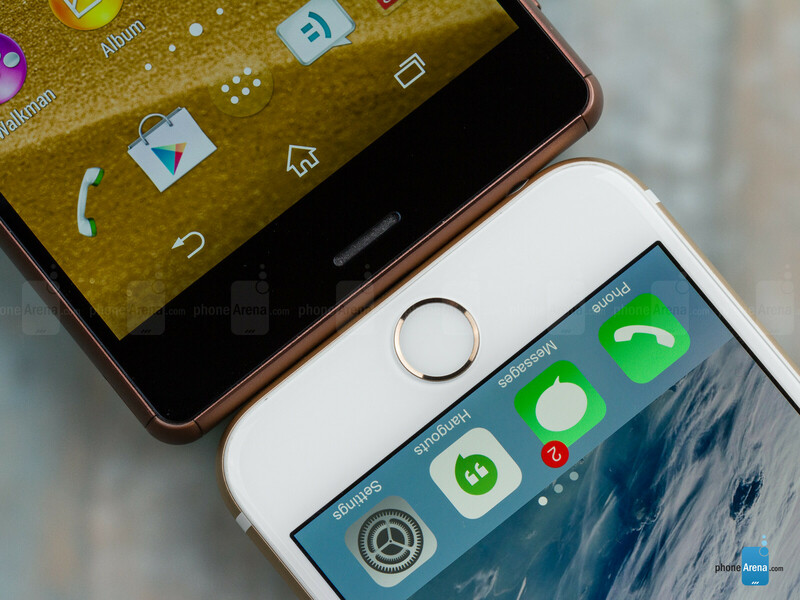 I have a question for phonearena, you guys say that the thick bezels on the iPhone 6 are there because of the touch id home button, but is it just me who don't see another home button on that thick top bezel? Where Sony Z3 has 2 speakers on front, that's why it is thick top and bottom. (It also offers better camera than the Z3, especially for low-light shots) Nice joke iPA you are getting funnier and funnier . It's pronounced ZEE THREE in American English. American English is also proper English. I have to admit that Z3 looks soooooooo!!! Nice and beautiful. Please Verizon get your s**t together and get this phone! All the Sony phones I've seen look like iPhone knockoffs. It would have been hard to choose if IOS wasn't that restricted and controlling. Z3 for the win. This gold/copper color Z3 and my gold 6plus would fill my need for phones. iPhone 6 vs Z3? I think iPhone 6 doesn't even stand a chance to Z3 Compact. Not an Androidtestant but I am expecting Appleholic defenders in 3..2..
Wow... this has been one of the most biased articles I have read here on PA... it is not even about the results, but the writing all over is bias towards Apple... except where there was absolutely no way for the author to level it... Examples: 1) DESIGN: "The two phones are both rather razor-thin and pretty light, though, which helps acknowledging them as elegant, despite the unimpressive screen-to-phone ratios" Z3 screen-to-size ratio > 70,75 iPhone 6 screen-to-size ratio > 65,80 So how come "both" offer uninpressive ratios? 2) DISPLAY: "Marred by decrepit color presentation compared to the iPhone 6" Yes, you also mention that you can tweak the colors on the Z3, and this particular feature makes the previous statement somewhat not as important... so in my opinion best display should go to the Z3. 3) INTERFACE: "The Xperia interface is getting a bit long in the tooth"... When Xperia keeps a great UI design for a while, it gets "long in the tooth", but when Apple does it, it is just an advantage because is simple and people is used to it... hmmmok. 4) INTERFACE 2: About Small Apps "The iPhone 6 doesn't sport that kind of interface frivolity, but its polished Control and Notification Centers are a joy to use, unlike Sony's archaic-looking connectivity switches in the notification bar that require a bunch of sliding and swiping to get to, for instance." So, windowed multi-tasking for power users and even regular users that need to use a couple of apps at the same time is frivolous? Control and Notification Centers on iOS is a joy to use?, prone to launch when scrolling... right... The toggles on new Xperias can be quickly accessed by 2 finger swiping just like on Vanilla Android...... definitely not a "bunch" of sliding and swiping. This argument is totally biased. 5) Processor and Memory: Yes, performance wise the iPhone is a beast, specially on benchmarks. But in reality, 1 GB of RAM will not be enough in the long term... people are experiencing problems with it for a while, more so when iOS evolve to a more feature-full OS. On the other hand, true multitasking, and the vast amounts of RAM on the Z3 will allow you to open previously accessed apps instantly while TRULY running in the background, not just freezing it. 6) CONNECTIVITY: You forgot to mention Z3's USB Host, Miracast, WiFi Direct, ANT+, Beidou (gps). 7) CAMERA: Not all modes available for the Z3 are tested... not even HDR is tested in the speed table... Pictures where tested only on 8MP Auto mode... where the Z3 actually takes better 20MP than previous generations... And dont say that people won't know... most people buying a 20MP phone will want to try the 20MP camera at full res... 8) CONCLUSION: Both phones have pros and cons, but the iPhone received a full paragraph explaining why it was better... and then the author only said that the Z3 has a lot going on for it... Wow... PA bias award: Daniel P.
It’s always like that with android phone vs. iphone...PA always praise iphone because they don’t want to get ban by apple like they did with the German tech magazine... I didn't even saw that news here. Wow you are so right.. I thought I was the only one at first realizing that everything he said about the iPhone 6 was always good even when the Z3 won the category. When the Z3 lost (in his own opinion), he made it sound so inferior. My favorite is when the Z3 clearly had the upper hand.. He'd admit it & slightly downgrade the iPhone 6.. you know, so he doesn't look bias (too late..) but then he would counter punch; finishing the paragraph by pretty much saying "the Z3 wins, but..ehh..who needs all that". I had to keep checking my web browser just to make sure I wasn't on Apple's website!! I'm sure they are paying you well over at 'Mac corp.' ..but seriously iPhone Arena.. Can you hire someone that will do legit comparisons please because this?.. this was atrocious. You forgot this -- "Sony's phone, however, has a lot going for it that the iPhone doesn't offer, if you can stomach the larger size." - oh the irony. he can stomach the big top and bottom bezels of the 4.7in iPhone 6 "Granted, you don't always need a waterproof phone or you might not care for stereo speakers but it's nice to know these are there if needed." - so the apple pay and the fingeprint sensor is a necessity I feel you bro. This guy is the most biased PA editor ever, bar none. I saw it, but ran out of space... thanks for complementing my post... It really is sad to see such great website full of bias instead of true objectivism. There are clear points where the iPhone trumphs Sony.. but the author did no effort to acknowledge where Sony clearly stand well above (besides battery life). Waterproofing your phone is reducing the risk of hardware failure for the 2nd highest reason of broken phones right after broken screens. So yea, pretty much needed in our watery world, with our watery habits, watery climate, humid seasons, and wet situations. Number 1 on my checklist for new phones.